It's Time to Restore Michael Jackson's Legacy to Its Rightful Place! The Newly-Released Book, Defending a King~His Life & Legacy, Does Just That. in a rare blend of disclosure, respect, insight, and passion—this is it! - Thomas A. Mesereau, Jr.
December 16, 2011 – Ponte Vedra Beach, FL – Veteran author Dr. Karen Moriarty announced today the release of Defending a King~His Life & Legacy (by Infinity Publishing). Understanding that “bizarre behavior is normal in bizarre circumstances,” Dr. Moriarty leads readers carefully through the maze of stunningly bizarre events and circumstances of Michael Jackson's life. With previously unknown revelations, the King of Pop is disclosed as a complex and vulnerable man who lived—and struggled--at the pinnacle of human existence. Dr. Moriarty's portrayal of the man includes explanations of why Michael was not a recluse, why he became nomadic after his 2005 criminal trial, why he veiled his children in public, and why he always kept millions of dollars in cash within arm's reach. The author affirms that Michael was heterosexual and that he struggled for decades with insomnia. Incorporating more than 200 sources, including accounts from a variety of people who knew Michael intimately, Dr. Moriarty reveals also where he went and what he did during those last four mysterious years of his life. 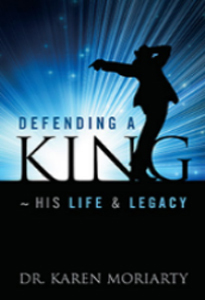 Defending a King~His Life & Legacy addresses the three biggest mistakes Michael made in his life: one that was only a temporary fix; one that more than anything else proved his child-like level of trust; and the one that caused his tragic demise. From the perspective and empathy of a psychologist, Dr. Moriarty not only proposes plausible explanations for some of the seemingly absurd elements of the mega-star's private life, but she also presents fully some of its truly unparalleled circumstances, which will strain the imaginations of even those fans who “knew” him best. King of Hearts. Not only in his humanitarian acts—he donated more than $300 million to charities—but in his private acts of kindness that few people know about, he was a man whose global legacy of goodness may ultimately outshine his reputation for greatness. Defending a King~His Life & Legacy is available from Infinity Publishing (infinitypublishing.com) and through www.defendingaking.com. Soon available from amazon.com and barnesandnoble.com; also as an ebook (both Kindle and Nook formats) in January 2012. Dr. Karen Moriarty has worked as a teacher of English and writing, a counselor, administrator, and consultant in public schools. She has also worked as a licensed clinical psychologist in private practice. She has earned advanced degrees, including a Doctorate, from Northern Illinois University. Karen is married to Dr. Robert V. Moriarty, a psychologist and former college president. They reside with their feline companions, Stephanie Ann and Tom Riley, in Ponte Vedra Beach, Florida. Visit her website at www.defendingaking.com. She may be contacted at defendingaking@gmail.com.